WebThermometer + NetThermometer je niekoľko programových utilít na diaľkové meranie teploty prostredníctvom prehliadač cez HTTP a TCP/IP. Verzia 0.99 upravuje niektoré problémy a pridáva Java rozhranie jThermo. WebThermometer + NetThermometer are a couple of utilities to measure the temperature remotely on the browser via HTTP (the former) or TCP/IP (the latter). If everyone attach the web thermometer to his computer connected to internet we will build a net of thermometers inside the internet, a Worl Wide Web Thermometers! What are the WebThermometer requirements? the following files in the cgi-bin directory: cgitherm.exe (Windows) or therm.cgi (Linux) and sekeleton.html. The skeleton.html file is the HTML template for the results page (optional). On the client side it requires only a web browser like Netscape Navigator, Internet Explorer, Opera, Konqueror, etc. What are the NetThermometer requirements? It's possible to run the server on Linux and the client on Windows and viceversa. distributed under the GPL license. You should read the COPYING file before to download. You can build it yourself because it's very simple (look at the schematic file schematic.png), however I'm going to build a PCB for the thermometer, and if you are interested you can send me an e-mail. 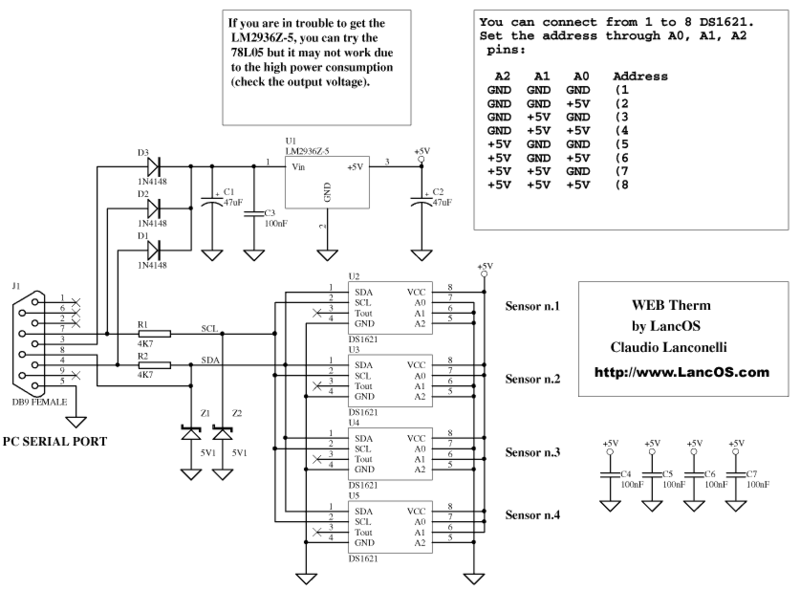 Alternatively the SI Prog multipurpose programmer is able to work with WEB Thermometer. How many sensors can I connect to WebThermometer? You can attach up to 8 temperature sensors (Dallas DS1621/DS1631), but probably with all sensors you need an external power supply (+5V). Can I change the html result page? I suggest to start editing the default skeleton.html file. Note that skeleton.html file must be in the same directory of cgitherm.exe file. If no skeleton.html is found, the default embedded template will be used instead. What does it mean "Err-11" response? Check that the hardware is connected and the correct COM port is selected on the server. Check also the serial cable, it should be a modem cable with all the pins connected. What does it mean "Err-13" response? Ther temperature sensor is not responding. Solution: connect the DS1621/DS1631 sensor and select the proper address (1-8). if the current temperature is 27°C. What does it mean "Err-14" response? The program can't open the COM port you selected. Usually the reason is another program are using the COM port, so change the COM port. Under Linux check that the http process has rights to read/write the selected COM port (/dev/ttyS?) and the /var/lock directory. Try the cgi-test script before to install therm.cgi (both are located in the cgitherm directory). What does it mean "Err-20" response? A timing error. Try to install the last version of webthermometer, if the problem persists send me an e-mail.